Need proffesional insurance repair quotes sent to your insurer? We can help! Trying to get some insurance repair quotes following damage to your property? IC Assist can help. If your home has been damaged and your insurer has asked you to get a couple of quotes for the repairs, just give us a call. We provide a FREE Claims Management service that will save you the time and hassle of trying to get a quote from multiple builders. As insurance repair specialists, we have a professional team of contractors that can help no matter what the extent of the damage. So whether you need a water damage repair estimate, or a quote for just a ceiling repair, you’ve come to the right place. IC Assist can help with all types or property damage. From minor damage to your ceilings, walls and floors, to complete refurbishments of your home, kitchen or bathroom. This also means that we can provide your insurer with one complete cost for all the necessary restoration. We send insurance repair quotes directly to insurers or Loss Adjusters. Why get involved in sending quotes to your insurance company when we can save you the hassle? As part of our FREE claims management service, we email our quote straight to your insurance company or Loss Adjuster. Insurers don’t usually request several estimates for repairs when IC Assist are managing the claim. In all the years that we’ve been managing insurance claims, we have only come across a couple of insurers who insisted on multiple quotes (these were on very large claims). In most cases, our detailed estimate has been sufficient, as insurers just compare our repair costs against their allowable rates. If there is a variance in our costs, we will negotiate with them in order to agree a price. Providing their rates are reasonable, we will adjust our price accordingly. This avoids the need for a second quotation from another builder. However, don’t worry if they insist on providing an additional estimate, as we can organise this for you. Why do insurance companies tell you to get multiple quotations for your insurance claim repairs? Unfortunately, most insurers inconvenience their customers by making them deal with several builders to get insurance repair quotes. Unfortunately, that means a lot of frustration for you. Firstly, you will need to make multiple calls to arrange for builders to look at the damage. Then, it’s pot luck if they will turn up when they say they will or even turn up at all! But, one of the biggest problems is actually getting the estimate from them, to pass on to your insurance company. Why do insurers put their customers through this hassle? Quite simply, because it’s easier and cheaper to let you and the builders do all the running around and do all the work for them! Once you forward the estimates to them, they will just pick the cheapest one! If however, you choose IC Assist to manage your claim, you can just sit back and relax and leave everything to us! How can you be sure the quote from a general builder will include all the property repairs you’re entitled to? Getting an estimate for water damage repairs from a general builder, plasterer or decorator is not a good idea. This is because they aren’t experts in insurance and do not specialise in water damage restoration. This means they don’t have drying equipment and therefore can’t quote for drying or treating or sanitising any wet building materials. Ensuring your building is adequately dried is the most important stage of a water damage claim. This is what makes IC Assist different to most other builders. We have professional equipment to dry your property before starting any redecoration. Also, if your insurer doesn’t come out and assess the damage, how do you know if the settlement will cover all necessary repairs? Unless they send out a Loss Adjuster to assess the damage, they will only be relying on the builders estimate. The biggest problem with this is, that if the builder misses something, you won’t be able to go back to your insurer at a later date. As a result, you will have to pay for any problems that arise! That’s why it is important to choose an insurance repair specialist like IC Assist. We will ensure our quotation includes all necessary costs to return you property to its previous condition. Depending on what damage has been caused, we can also include costs for specialist services. These can include things such as property drying, Building Control, Structural Surveyors, Party Wall Agreements etc. 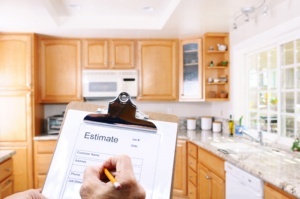 Can I get a FREE estimate without using your Claims Management Service? We only provide a FREE quotation if you want us to manage your claim and carry out the repairs. This is because our insurance repair quotes are very detailed and can take a lot of time to produce. Typically, it takes about one hour to survey the damage and another hour to produce a detailed schedule of works, in order to determine the total restoration cost. With larger claims however, it can take a lot longer as the damage usually affects multiple rooms or an entire property. Our unique FREE service is perfect for homeowners who just don’t have the time or patience to deal their insurance claim. If you appoint us to manage your claim, we will deal everything for you. This includes the quote, your insurer and managing the repair process. There is no charge to you or your insurer for this service, providing we carry out all the repairs. Please feel free to take a look at some of the feedback below from our customers. Alternatively, you can also browse through our Facebook albums where you can see before, during and after pictures of insurance repairs we have completed. Don’t waste your time getting several quotes for your repairs, just call us on 0800 4337 290 and we’ll take care of everything!